The Cartier Pasha Seatimer is a traditional timepiece with elegance integrated into its design. 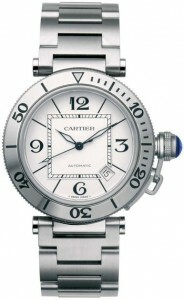 This Men’s watch from Cartier is an old fashioned luxury item based off of one of the brand’s earliest swimming watch. 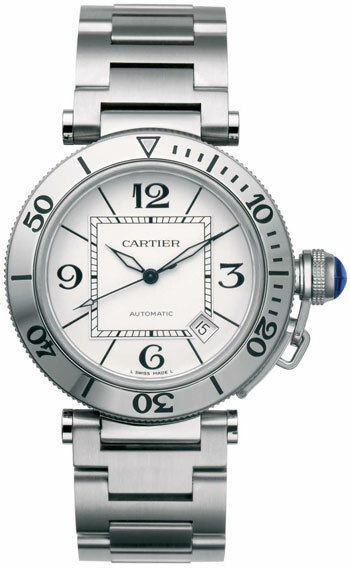 As the story goes, Cartier watch makers were commissioned by the Pasha of Marrakech in 1933 to create a water resistant design to be worn while swimming. 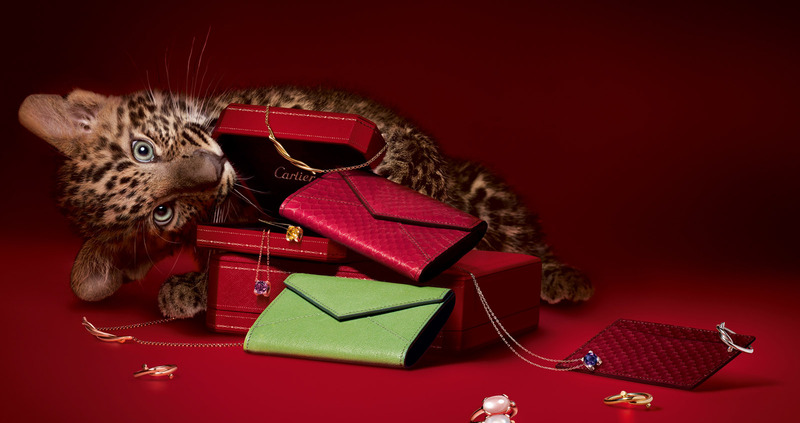 It became one of Cartier’s earliest water-resistant timepieces. Since then the design has been improved to highly resilient against scratches, fractures and water damage with its stainless steel casing sapphire crystal surface. The Silver dial is host to numerous style features. The black Arabic font numerals are highly visible against the silver dial, as are the diamond shaped extremities of the hands. The white diamond boxes of the hands are coated with a luminescent material, making the watch readable amidst the darkest pools. The seconds index is formatted into a square box, making it distinct looking from the rest of the round shape. A small window revealing the date is housed between the 4 and 5 o’clock position. The Swiss automatic movement powers the watch during wear, revolving while walking or while treading water. The crown is protected by a screw down cover of sapphire-spinel and steel. If gone unworn for a few days, the W31080M7 can be wound by the crown head which Cartier has covered with a screw down cover and laid with a sapphire-blue spinel. The unidirectional bezel is clearly marked with large black numerals on steel trim, rotating only counter-clockwise to ensure diving safety. The stainless steel bracelet is secured by a hidden folding clasp to ensure it won’t fall off during a swim. Even though this watch is water-resistant, it is only designed to survive for 300ft or less. 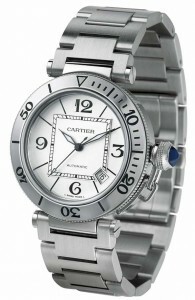 This is ideal for surface swims and shallow snorkeling at best but anything more would require a more resilient watch. This is certainly a luxury design watch, complete with a luxury design price of $5,200 to prove it. For that price however, I’d be cautious of wearing this piece during any dip into the lake for fear of losing or even just having to clean it afterwards. The screw down crown cover is a brilliant addition to an already stylish watch but it also protrudes quite far from the design, raising fears of chipping or knocking it off of the frame which could lead to further complications if the crown itself became damaged.